How Do Toadstools Grow Through the Pavement and Why Do Mushrooms Push Up Through the Sidewalk? Toadstools that force their way up through asphalt are probably ink-cap mushrooms (Coprinus) growing on buried plant debris. They are pushing upwards because their stalks function as vertical hydraulic jacks. The upward pressure comes from the turgor pressure of the individual cells making up the wall of the hollow stalk of the mushroom. Each individual cell grows as a vertical column by inserting new cell wall material uniformly along its length. The major structural component of the cells is a shallow helical arrangement of fibers of chitin winding round the axis of the cell. These chitin fibers are embedded in matrix materials, making the wall material like a carbon fiber composite. Chitin is an exceptionally strong bio-polymer, also used by insects for their exoskeletons, and gives immense lateral strength to the fungal cell wall, so that internal pres-sure is confined as a vertical column. Water enters the cell by osmosis, and the resulting turgor pressure provides the vertical force that allows the mushroom to push up through the asphalt. This phenomenon was first investigated 75 years ago by Reginald Buller, who measured the lifting power by loading weights onto a mushroom that was elongating inside a glass tube. He calculated an upwards pressure of about two-thirds of an atmosphere. The cells have a gravity-sensing mechanism that keeps the mushroom exactly vertical. 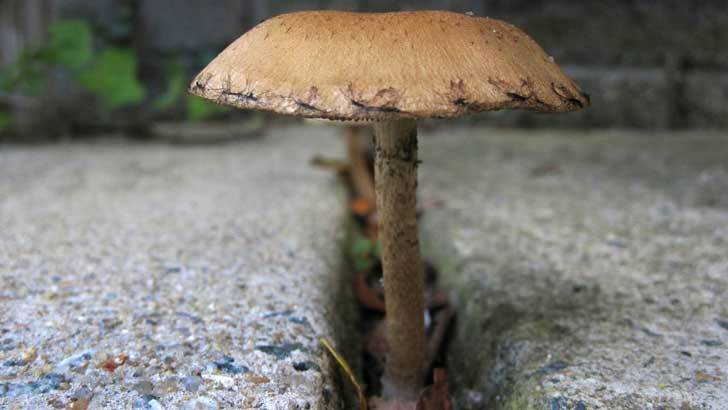 A mushroom that is put on its side will rapidly reorient to grow vertically again. Two inches of asphalt is nothing to the muscular mushroom. One large shaggy ink-cap (Coprinus comatus) discovered in Basingstoke lifted a 75 by 60 centimetre paving stone 4 centimetres above the level of the pavement in about 48 hours. Historically, mushrooms often sprang up in foundries, supposedly from horse manure used in preparing loam for casting, and were often reported as having lifted heavy iron castings. Presumably these would have been some type of field mushroom such as Agaricus campestris. Whatever the species, the mechanism by which the force was exerted is likely to be the same, namely hydraulic pressure. As Buller found, the exquisite and fragile Coprinus sterquilinus exerts an upward pressure of nearly 250 grams with a stem 5 millimetres thick, so it is not surprising that more robust species can tear the tarmac. What is the Difference between Mushrooms and Toadstools and are all Mushrooms Toadstools? How Fast Do Fingernails Grow, Do Fingernails Grow Faster In Summer, and How Fast Do Toenails Grow? How Did Toadstools Get Named?